A few weeks ago (Mothers' Day, to be exact), Grits and I did another show...we stayed on his channel and didn't go on shortwave at all. As predicted, it was a lot more free-wheeling, and a helluva lot longer too! We played all kinds of stuff...a little jazz, a little blues, a little country, some psych (mainly for Metal-Muncher, of course! ), and some vintage commercials too. And a large number of Mother songs...it was Mothers' Day! We were visited by Lily (a chocolate Lab), the newest member of the Grits household. We'll post a picture of her sometime. We also had a very special visitor, Annie! Unlike a certain orphaned comic character, this Annie has lovely eyes. 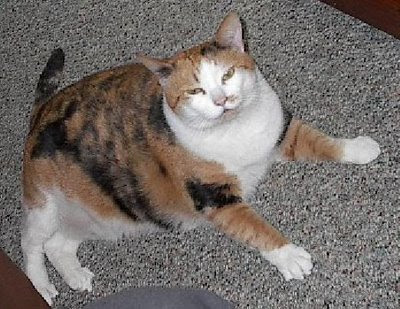 I call her my li'l Calico Blob. We beat her up a little (with lots of love, of course!) on the air. It would be crazy to post a four-hour long show here, wouldn't it? So I'll just post a few highlights. Hope you like 'em! With all of the hoopla about H1N1, I had to play the best song I know about influenza (the real 'flu, not the boogie-woogie type). There was an outbreak in 1929...not as bad as the 1918 pandemic, but serious enough to inspire this terrific gospel record. King Edward Hotel, Jackson, Mississippi, 18 December 1930: Elder Curry; guitar & vocal; Elder Charles Beck, piano; Jo Ann Williams, lead vocal. This was a variation on the old standard, God's Mighty Hand. 1961: Dennis Bell, vocal; unidentified orchestra and Insipid Female Chorus. Ah yes, the immortal lines "we've all got spots, we're covered with red dots." I suppose I shouldn't joke too much about measles...I somehow survived a rare double-dose of the goldurned disease when I was six. I don't remember a lot of the ordeal...apparently I was unconscious through most of it. Shoot...I'm still somewhat unconcious, right? April 14-15 marked the 97th anniversary of the sinking of RMS Titanic. The disaster spawned quite a few songs...including this record by Richard "Rabbit" Brown. It's hard not to notice his slight garbling of the facts...the ship was sunk by a "gruesome icebreaker" and "Southampton" comes out "South Hamilton." It's still (to me, anyway) the most moving musical account of the tragedy. New Orleans, 11 March 1927: Rabbit Brown, vocal & guitar. Astute collectors out there will note (by the serial number) that this was a twelve-inch record. Victor pressed only six twelve-inch "Race" records...most were sermons. I have one of those...someday I'll post it. My other favorite account of the Titanic story is Blind Willie Johnson's God Moves On The Water. I'll post that one someday, too. I dedicated the following cut to Annie and Elvis (and their furry friends). 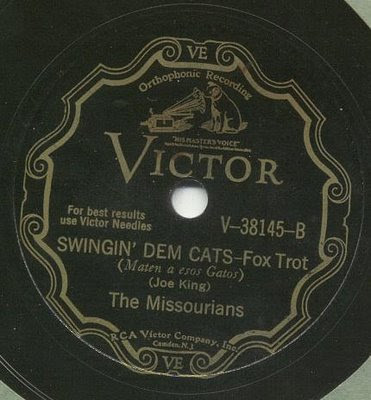 It's Swingin' Dem Cats, a particularly rousing hot jazz record by The Missourians, from the last session they did before Cab Calloway started leadership of the band a few months later. This side has some great solos and ensemble work...but it's the clarinet of William Thornton Blue that sends me every time...he comes in like a cat bat out of hell. NYC 17 February 1930: Lockwood Lewis, conductor; R. Q. Dickerson, Lammar Wright, trumpets; De Priest Wheeler, trombone; William Thornton Blue, George Scott, clarinets & alto saxes; Walter Thomas, clarinet, tenor & baritone sax; Earres Prince, piano; Morris White, banjo; Jimmy Smith, tuba; Leroy Maxey, drums. Cincinnati, Ohio, 23 December 1947: Wynonie Harris, vocal; Oran "Hot Lips" Page, trumpet; Hal Singer, Tom Archia, tenor saxes; Joe Knight, piano; Carl "Flat-Top" Wilson, bass; Clarence Donaldson, drums. For years I assumed that this cut was recorded at the end of a session, with someone saying "hey, we have five minutes of studio time left! Let's throw a blues together!" It has that kind of spontaneity. But the matrix numbers show that Blow Your Brains Out was actually the second title waxed in a six-side session! 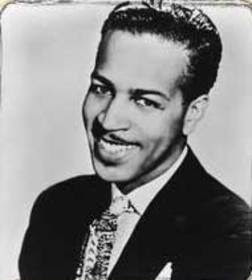 Wynonie sounds like he's struggling a bit to come up with something to rhyme with "Archia." He zooms in on a "Time marches on" motif. Harris introduces the other tenor sax as "Oklahoma." (Hal Singer was from Tulsa, and was a few months away from scoring a huge hit [and a new nickname] with Cornbread.) Of course, as much fun as the improvised lyrics are, it's the honkin' saxes that are the stars here. I've had two or three copies of this on 78...I've never seen a copy that wasn't worn to around F+/G- condition. This side got played. And played. And played! 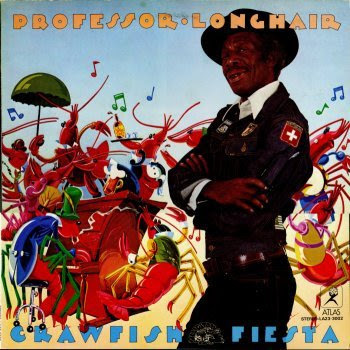 Grits had the Crawfish Fiesta album on his hard drive. 1980: Henry Roeland (Roy) Byrd, piano & vocal; large ensemble featuring Mac Rebennack (Dr. John), guitar. We played the song...no, we didn't dedicate it to our moms, although we did think about it (only kiddin', Mom!). Buy the album...you won't be disappointed! NYC, 13 February 1941: Aaron Lebedeff, vocal; Sholom Secunda Orchestra. What a record! He sings about the Old Country...the delights of dancing, eating and drinking. You can find the original Yiddish lyrics along with a translation at the bottom of this page: http://www.cascobaytummlers.com/lyric.html ...although it's impossible to translate his lip-popping. A couple of people have asked me about the song I like to sign off with...it's one of the prettiest white gospel records I've ever heard. I especially like the full sound of Karnes's fancy harp-guitar. His thumping bass notes remind me of those of Rabbit Brown (compare this cut with the Titanic one above). Bristol, Tennessee, 28 October 1928: Alfred G. Karnes, vocal & harp-guitar. This was recorded at the second batch of sessions Victor held in Bristol. Well...that'll do it for now, I guess...'til the next time, eh? Before we get started, I should thank the folks over at the I'm Learning To Share! blog (http://learning2share.blogspot.com/2009/04/search-term-jugheads-hat.html) for the nice plug...I'm glad to see other people like whoopee hats! I notice that I've been getting more download traffic on some of those older posts as well! Thanks again! For the last couple of weeks, the biggest news out of Washington seems to concern Bo Obama, the official First Doggie. LBJ caused a storm of protest when he lifted Him by the ears. 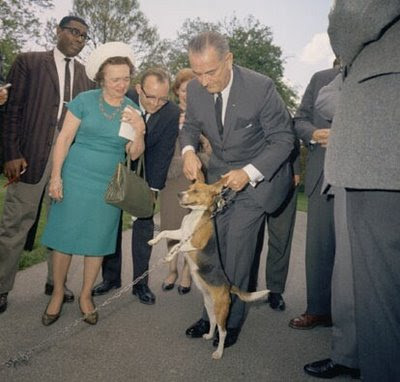 The president replied that the dog actually enjoyed it. I dunno...does Him look like he's smiling? Anyway.....Him was the subject of an interesting 45 by Daws Butler and Dave Barry...Butler's voicework in cartoons is well-documented elsewhere, and Dave Barry (1918-2001) was also a cartoon voiceman and comic. There is no relation between this Dave Barry and the syndicated writer of the same name. Early 1965: Daws Butler, Him and LBJ; Dave Barry, the reporter. 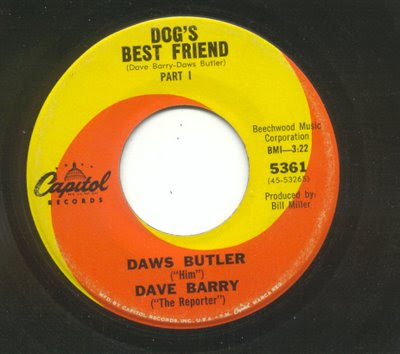 Here's another pseudo-political record about a canine, issued in 1959 to cash in on Disney's The Shaggy Dog. 1959: Shaggy Dog and Toy Poodles, vocal. Tutti Camarata composed the piece and probably led the orchestra. The voice of Shaggy Dog sounds suspiciously like Paul Frees. 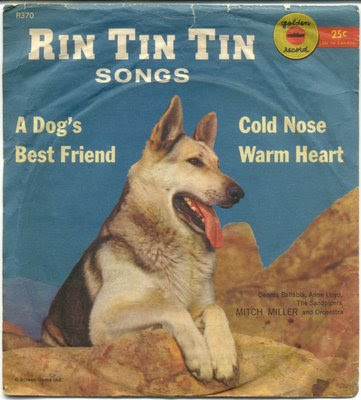 I was reminded of another Dog's Best Friend record, issued around 1957, featuring a pair of songs inspired by Rin Tin Tin. 1957: Dennis Ballabia & Anne Lloyd and The Sandpipers, vocals; Mitch Miller Orch. Columbia's budget Harmony label issued a whole LP about Rinty and friends...I'm guessing that the four adventures on this album were originally singles in the Columbia children's series. If enough Sanctum readers ask, I can be persuaded to post this album...it's actually rather entertaining, especially for those of us who are going through our second (or third) childhood. This one is by The Original Memphis Five, a hugely popular group that seems to have shown up on just about every record label in the early 1920s. They blast through Dog with characteristic aplomb...and someone (unidentified) supplying the barks. Note the spelling...Barking has a "-g" and each Woof has its own exclamation point! NYC, 6 November 1922: Phil Napoleon, trumpet; Charles Panelli, trombone; Jimmy Lytell, clarinet; Frank Signorelli, piano; Jack Roth, drums. Cute record. Plenty hot, too. Oh, the brown shellac on this record isn't anything special...if anything, it is less durable than the usual black stuff. Here's another version of the same song, played a bit straighter, and without the barks. The spelling is a bit different too...the "-g" is missing from Barkin', and only the second Woof! gets the exclamation point. The Woofs are in parentheses too! Does anybody out there have the sheet music? I'm curious to see what the actual punctuation should be. Chicago c. 12 October 1922: Frank Westphal, piano & leader; Charles Burns, another (unknown), trumpet; Herb Winfield, trombone; Jack Richards, Bill Richards, alto saxes; unknown, tenor sax; unknown, banjo; John Jensen, tuba; unknown, drums. Notice, on this version, there's an interpolation of a song called Walking The Dog. Here's another (full) version of Walkin', performed by a young up-and-comer named Hoagland Carmichael. Richmond, Indiana, c. 2 May 1928: Bud Dant, cornet; Chauncey Goodwin, clarinet & alto sax; Harold Keating, clarinet & tenor sax; Hoagy Carmichael, piano, vocal, and leader; Eddie Wolfe, violin; Arnold Habbe, banjo; Jack Drummond, bass; Andy van Sickle, drums. 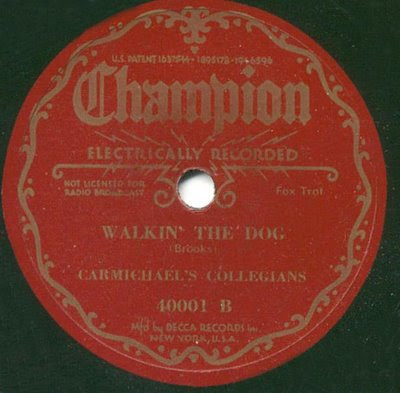 This is actually the third issue of this record...it was originally issued on Gennett in 1928, and on Gennett's cheaper label Champion shortly thereafter. My copy is on a Decca-pressed Champion from 1934. None of 'em are very common. Too bad. Memphis, 21 August 1963: Rufus Thomas, vocal; others unidentified (sounds like Booker T and the MGs to me). For the record, my copy of this record has a white label, and the flip side is Fine And Mellow. Other copies are blue labeled and have You Said on the flip. 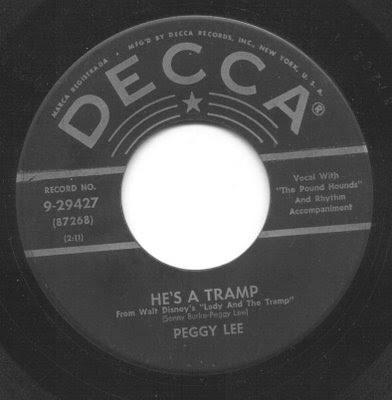 1955: Peggy Lee and The Pound Hounds (The Mellomen), vocal; Oliver Wallace, Disney Orchestra. I suppose I should play the flip side...otherwise Elvis and the other Grits Cats might not let me in to do another radio show. 1955: Peggy Lee, vocal; Oliver Wallace, Disney Orchestra. In 1991, Peggy Lee and Sonny Burke were finally awarded over $2 million from Disney, who had been raking in lots of money from the home video market (without remembering that Lee and Burke retained the rights to the songs they co-composed). See you then...I think I have to chase my tail.